I’m headed out to the Blue Mountains for a weekend of birthday fun, so there will be no Fan Art Friday this week. Instead, allow me to belatedly roll out the new Uglies covers! They’ve been around on the internets for a while, but I haven’t shown them here. The new covers are finally leaking into stores, though, so now is a great time to show them. Click here for the bigger and zoomable version. Of course, whenever new covers appear online, they create dissent and controversy. Fans mostly don’t like new looks for books, because the old covers are the ones they’re used to. If you’re a fan, after all, that old look was probably the reason you picked up the books in the first place! So really, the new covers aren’t for fans at all. You guys already HAVE my books, after all. These are for all the people who’ve never picked up Uglies because the old covers looked boring or stupid to them. Maybe they never even noticed the series on the shelves. It’s for non-fans (who probably don’t read this blog) that this new look exists. So feel free to complain! For me the Original Style covers are still classics, but I get why S&S has to hit the refresh button after, what, six years? And you have to admit that these new covers are very lovely indeed, and are unified in a way the Original Flavor ones weren’t. (Pretties had a different designer than the other three, in fact. You can tell.) The new ones also have a cool, clinical feel that nails a lot of what the series is about. But I will take this opportunity to express my appreciation to Rodrigo Corral for his awesome work on the first cover of Uglies. Covers matter, and a lot of you, possibly many thousands, would never have seen the Uglies series without his strokes of genius. And that would mean less food, clothing, and shelter for me. And I like food, clothing, and shelter. So, thanks, Rodrigo. The rest of you should click here for an archive of his other work. I think you’ll agree that the dude rocks. Oh, and I also love how under one manicured hand, the doctor has a sharp evil-looking scalpel. Best of luck, and best birthday wishes to you Scott! OMG!!! LOVE THE EXTRAS COVER. The rest are too creepy, but I think a lot of people will pick them up because of the new scifi vibe, and the rest of us will stick to the old ones. 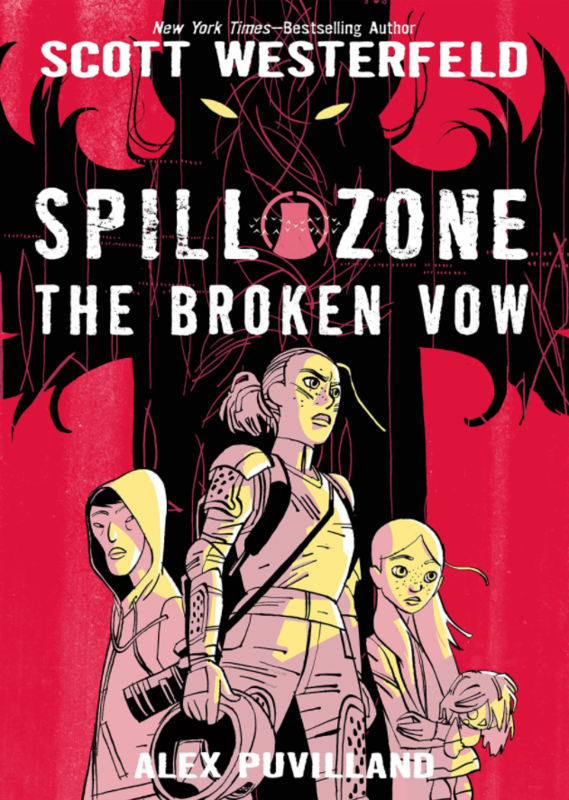 =] The pretties cover seems more true to the book, and the specails cover is straight up cool. The only one I really hate is the uglies cover, for the new version and the origanal, they just dont have the right vibe. The old pretties cover was really ugly.. I really like the new covers, and the old ones are great too. 🙂 I can’t decide which one I like better. But in the end it is still the same excellent story so, so what about the covers. jk I like the covers of books. I haven’t read the Uglies series, but I do like these new covers better than the old ones. The uglies on that dudes website. This quiz will show you if your an ugly, pretty, or special. (1) what are somethings you’ll find in your wardrobe? C. anything that looks hot and is easy to run in. (2) What is your dream home? C. A hidden lab where you can see everything thats going on in the world. (3) What is your dream job? (4) When you look in the mirror what do you see? B. Zits you need to pop. C. A cold beautiful face. (5) Whats your fav movie? (6) what is your favorite drink? go to the smokeys or become a pretty. i absolutely LURVE the extras cover (too bad that’s the one i actually OWN) but the rest seem like there isn’t any color (the specials is nice though) and i like color. These are beautiful! HA! I totally called the new covers a few posts ago. This pleases me. Also, I didn’t notice it the first time, but what they do to make the cover names pop out is pretty sweet (putting the other titles in gray text, popping the actual book’s name in color). hey, extras has a tagline now! lovin the new covers! Okay, don’t take this the wrong way, but does that sound like Edward Cullen to anyone else? You really could have pulled that as a direct quote from Twilight. I kinda like the new covers and I saw them at my local bookstore. Well, I like the original Extras cover better; more techno-looking to me. Of course I wouldn’t buy these new covers since I already have the series (unless something happens to the old ones, god forbid!) but it’s nice to see new covers! Yes, ur right now that you think about it. That could be a Twilight quote. I love these new covers Scott!!! They are more grown up from the other covers, if you get what I mean. I think these covers would attract older teens to read the book. I’ve never read uglies, but one thing that turned me off them was the old covers. Well. Hmm. I like the new ‘Pretties’ cover a lot. It’s cool, in a kind of weird way. ‘Uglies’ and ‘Specials’ are okay, although I prefer the originals. ‘Extras’ is . . . I dunno. I like it, ’cause it goes with the theme of the other books, but it’s different (sort of like how the story goes along with the other books, but is way different in so many ways), but I think that the sideways thing is a bit much. Or maybe if the face wasn’t so close? Not sure. And the ‘Extras’ tagline was cool–I bought the book in hardcover, so I’ve never seen it before. Over all, though, I like ’em. 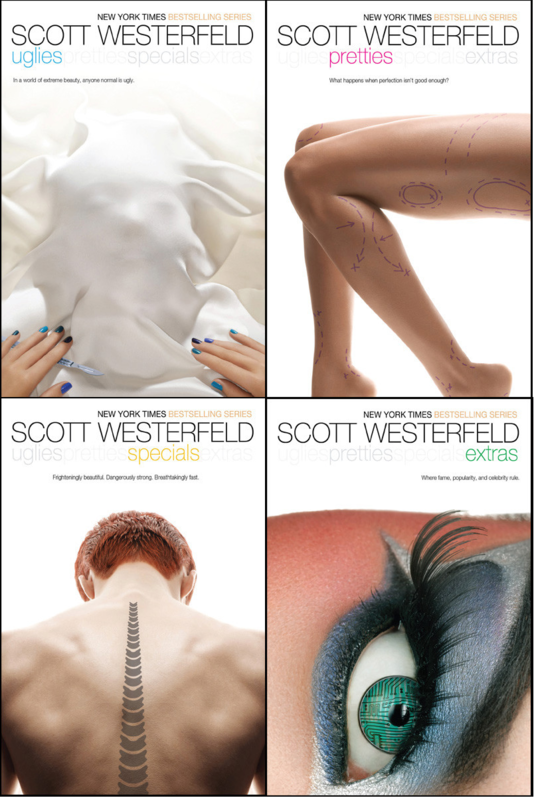 Good job, um, S&S person-who-does-awesome-Scott-Westerfeld-covers. Also the guy who did the originals–Rodrigo, did you say? Yeah. Cool, dude. I’m actually a fan, and I really love this covers!! I think they’re more mature and they reflect better the spirit of your excellent work! Very pretty-making. I actually walked into a bookshop today, and saw them. I think the lady who worked there was faintly amused by the bubbly expression on my face. Can you people decide? It’s kind of hard to figure out what kind of book this is, when half the people mean the original cover was best, and the other half mean the new one is best, and the third half mean neither fits. I like pretties and specials. Uglies looks creepy and extras looks fabricated. I personally love the new covers. It just angers me because I was supposed to buy the rest of the books next allowance because my high school library doesn’t have them and I haven’t read the series since like 7th grade XD I only have Uglies and Pretties at home. This beautiful person reminds me of Alek D< I don't know why, since I think you said that Alek doesn't play any instruments X'D I guess my mind automatically stereotypes all European guys into one category. The new covers look like they’ll get more adult fans, which is good! Though I’m a fan of the old covers because “they are what I am used to and what made me pick up the books in the first place” 😀 I have to say, it’s always good to have a change of covers. And OTL I just realized I can’t believe I missed it D< Happy belated birthday! I did indeed get the book because of the cover…which led me to buying almost everyone of Scotts books….but i do kinda like these covers but its not something i would pick up off of the shelves…. i think they look too well..whitee..there needs to be more color.. I LOVE the original covers, and they in part convinced me to read them, (being the first books by Scott that I read) and they will always be my favorites just because I don’t like change and they were perfect that way. Also, they are just what I think of. The new covers, however, are also great, though they have a different feel to me. If I were a non-fan, I would love them, but since I already am a fan, I’m gonna stick with the books already on my shelf :D.
Love them Scott, and good point about the whole fan vs. non-fan thing. . .
the first and last one freak me out, the middle two I understand. I agree that the first Uglies cover is amazing. the other three needed an update though. So, I saw the books in the store today, and I noticed something awesome about them that I couldn’t see in these pics: the names of all the books are on every cover, and the name of that particular book is colored. Awesome! Made me like these covers even more, although I was relieved to see that the store still had a few copies of the old covers, too (don’t think that’ll last too long). Ah, and the computer says it’s May 9th!!! So even though it’s not my birthday were I live…it is on the internet! Whoop! I just feel like the old ones had more… energy? Action? I’m very big on color schemes, especially on books, and I liked the colors on the old covers. But these are kind of neat… I’m iffy but not horrified. I think the covers look pretty awesome, but I definitely like the old covers better. I also think the *old* Pretties cover was my favorite of the four. I have a question (about Leviathan) have you ever thought of adding humans that have been genetically modified to the Leviathan story? I know, kind of random, but hey anything could happen in a world you create right? WHAT!!!!! New harry potter covers!? (kicks a chair) my informants are failing me. @Rae: You say lurve to? What a coincidence. Also have any of you ever heard of the Freelance Whales? It’s a band thats got some good songs, but mostly the band name made me think of Levithan. They definitely do have that “clinical” feel to them. I’m still attached to the original covers though. The new ones are fantastic, but they don’t remind me of the series, since I’ve spent the last five(?) years looking at the original ones. @gerardo: 0_0 That’s so weird…I had a dream where Deryn, Alek, & Barlow got captured, and Deryn said she was fabricated in order to save everyone…..
SWEET! Speakin of which, today I found a copy of extras in the parking lot…guess who’s got a new book? Love the new covers! I’m a new reader from the Kindle, wondering when Specials will be back up for sale. I zoomed through the first two and was devastated when Specials was gone! I’m satiating myself with Midnighters for the moment. Any idea as to when Specials will be back? I went on to Devian Art last night and looked at Leviathan fan art. It got me super excited for Goliath, so much I couldn’t sleep. So I tried to calm myself down by drawing non-leviathan people. In the end when I woke up the next morning I looked at them, and realized it was Alek, Dr. Barlow(ish), and a really crummy one that I guess was supposed to be Volger, maybe. Except they where in modern clothes. Perhaps I should put them on DA.